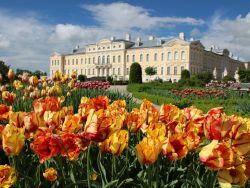 The capital cities of the Baltic region are often overlooked in favor of more common destinations, but while London, Paris and Rome may look picture-perfect on a postcard, Vilnius, Riga and Tallinn boast some of the best hidden architectural gems in Europe. Leisurely avenues replace bustling streets, and the old coexists in harmony with the new, from the starkly medieval to the sleekly modern, with monuments to multiple eras in between. 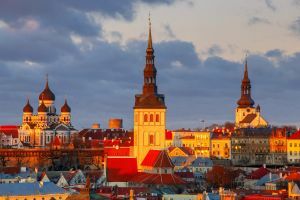 Tallinn is the peaceful capital of Estonia, where architects were invited from the Baltics and beyond to develop the city, contributing to an eclectic mix of styles and personalities largely formed in the late 19th century. Art Nouveau found a loving home here, thanks in part to the Estonian architect Jacques Rosenbaum, who designed landmarks such as the house on Pikk 18, possibly the most well-known Art Nouveau building in Tallinn. Two large dragons sculpted by August Volz flank a single large typically curved window on the ground floor. Above it, two stern Egyptian women with bare torsos emphasize the verticality of the façade. The Egyptian theme is repeated by two herms just below the roof-line. Russian influence can also be found throughout Tallinn, dating back to when Estonia was a governorate of the Russian Empire. 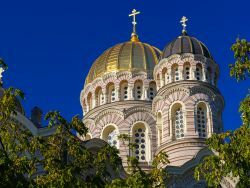 The Alexander Nevsky Cathedral is one of the most visually striking examples of this influence, constructed in the Russian Revival style of extravagant domes, vibrant colors and delightful flourishes. 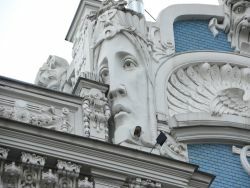 Riga is the capital of Latvia, another testament to the endurance of Art Nouveau that can be found in the multi-story buildings that populate the city center, most of them over one hundred years old and painted in pastel blues, reds and oranges. 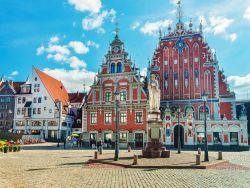 Traditional design elements are also prevalent throughout different districts in the city, with charming wooden buildings forming the basis of the Kalnciema Quarter, a bohemian hub of arts, crafts, live music venues, and authentic Latvian culture. Lithuania is also known for traditional wooden buildings, some of them intricately detailed and more often found in smaller towns. Larger cities like Vilnius moved towards brick rather than wood as the primary building material; while Vilnius is well known for its Baroque style, the Gothic period left its mark in the capital city on such architectural gems as Saint Anne’s Church. The Old Town is the historical center of Vilnius, a concentration of many different architectural styles including Baroque, Gothic, and Renaissance. Officially designated a UNESCO World Heritage Site, the Old Town is home to Vilnius University, framed by 15th century buildings and featuring 300-year old frescoes as well as the Church of St. Johns. The Gate of Dawn is the only surviving gate of the first original five gates in the city wall, host of a painting of the Blessed Virgin Mary, purported to have miracle-working powers.